In our earlier article, we discussed "Single stage Well points" and "Multi-stage Well Points". Now we will move on with our discussion on Vacuum Well Points. Well points cannot be used successfully for draining silty sands and other fine sands with an effective size less than about 0.05mm. The coefficient of permeability of such soils is generally between 1x10-5 to 1x10-7 m/sec. These soils can be effectively drained by using vacuum well points. For installation of a vacuum well points, a hole of about 25cm diameter is formed around the well point and the riser pipe by jetting water under pressure. When water is still flowing, medium to coarse sand is filled into the hole upto about 1m from the top. The top 1m portion of the hole is then filled by tamping clay into it. It forms a sort of seal. Any other impervious material can also be used instead of clay to form a seal. Well point spacing is generally closer than that in a conventional system. 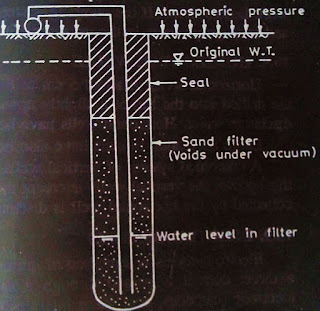 When the header is connected to a vacuum pump, it creates a vacuum in the sand filter around the well point. 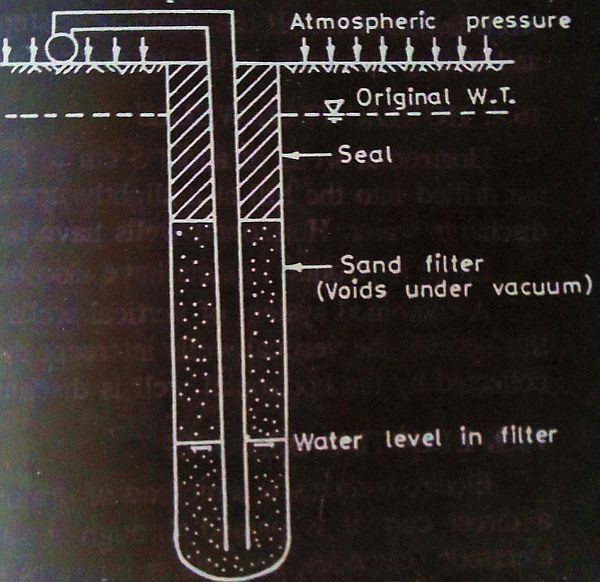 As the pressure on the water table is equal to the atmospheric pressure, the head causing flow is increased by an amount equal to the vacuum pressure. The hydraulic gradient increases and it overcomes the flow resistance in the soil pores. The ground water flows to the region of vacuum in the well points and drainage occurs. As the effective pressure on the soil is increased, consolidation takes place. It makes the soil stiff. However, the process is slow and it may take several weeks for the soil to become stiff enough for carrying out the excavation work.